Independently from what others may tell you, moving in winter time is possible – with a little bit of planning. Here are some time and life tested steps. Make sure you have shoveled the snow, salted the ground to prevent you or the movers you hire from falling and injuring themselves. Do the cleanup the night before the move and inspect it in the morning to make sure that it is still safe and relatively dry. 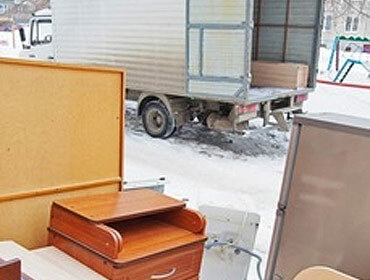 Protect your floors with cardboard, plastic or secured tarp to prevent the snow, slush and mud from leaving marks and stains as movers leave and enter your house multiple times. Especially, if you have newborn pets or crawling babies, it’s best to keep the floor as germ free as possible. Pack your things carefully in appropriate size boxes and secure them with moving tape. Pack fragile and expensive items in bubble wrap, newspapers, blankets or Styrofoam. Many glasses, plastics, electronics and antiques can get damaged due to extreme weather conditions, so insulate them from the frost and the moisture. Slow and steady should be the motto during any move, especially a winter one. Plan the move during the peak lighted hours of the day, monitor changing weather and road conditions and ensure that your driveway and path are continuously salted. Wear layers that you can take off or put on easily depending on the weather conditions. Wear closed toed comfortable running shoes and please wear gloves. My husband and I learned that one the hard way – freezing fingers are not fun when you are carrying a sofa in the cold! Eat a good meal, stay hydrated during your move and think positive despite the uncomfortable weather conditions. Soon, you will be creating memories in your new home!